I wonder, though, how is this tackling the homeless issue? It reminds me of living in Seattle when the city leaders would push the homeless and drug addicts from one part of the city to another in a sort of underclass game of musical chairs. No problems were solved, just relocated. See that rock over there? The one to the left of your peripheral vision? Yes, that’s the one. That’s been the home of this SF resident for the past 6 odd years. If you look a little closer, you’ll be surprised to see the vibrant community beneath that rock. We’re all different shapes, sizes, and colors but there is a great common denominator amongst us; we are not native to San Francisco. And perhaps because of that, or in spite of that fact, we have congregated there, drawn to one another because there seems to be this invisible barrier that prevents us from connecting with the true locals. Is it that y’all are shy? Are you just really into your clicks? Whether you hail from southern Cal or Boston or even New York, you must know what I’m talking about. How long were you living in this beautiful city before you transitioned from “acquaintance” to “friend” status with your social network? I had all but forgotten this pet peeve about San Francisco until attending a recent Giants baseball game. The scene may be different from your experience but essentially three degrees of separation existed between all the attendees. And while I’m no social butterfly, I made a concentrated effort to reach out to everyone in the hopes of making an impression worthy of a phone or email exchange. I left empty handed. Maybe it is really me but I’m sure there are others who know what I’m talking about. Fess up natives–what gives? I’m surprised that no one has mentioned it, but the Castro Street Fair will be this Sunday from 11 am to 6 pm. 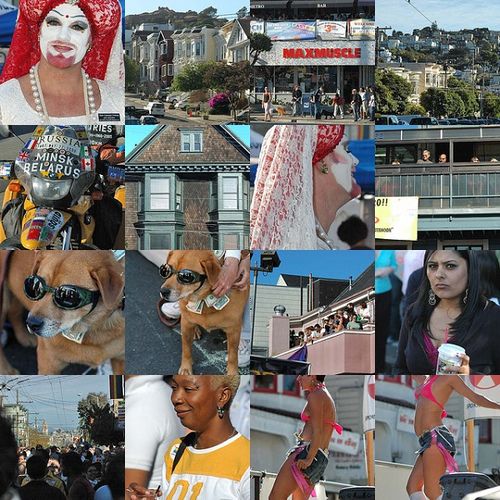 Come out and enjoy the Castro crazies. With the political season heating up, you can bet there will be plenty of political and community organizations represented at the booths. Other than that and the slew of great shows that are lined up, just go support the heart of the gay universe: the ‘Stro. Back in the day Lollapalooza and Hoarde were the only music festivals around. Now it seems every genre and their mother has a music festival, not only in the U.S. but around the world. A couple smaller festivals are coming up that combine the best and most diverse of today’s new music. First up is the Download Festival today at Shoreline. The lineup is extremely good especially at the low price of $25! MBSF readers who enjoy making things (e.g., those who liked my story on the Maker Faire back in April) will love this one: this weekend, TechShop opens in Menlo Park. The MAKE blog has more (and a podcast), but in essence, it’s an open workshop, offering daily, monthly, and annual access for people who want to use state-of-the-art gear to work on their projects. They have a massive array of classes in the works, and special opening festivities this weekend. I’m this close to hopping on Caltrain and checking it out. This afternoon I took a walk through Cuesta Park. I felt uneasy watching moms and dads playing there with their young children. Were they not aware of the danger lurking in the trees? Hadn’t they heard of the recent vicious squirrel attack on a 4-year-old boy? The squirrels in this Mountain View park have gone wild. What these crazed rodents are thinking, with their little ping pong ball sized brains, we may never know. They have gone too far by jumping into baby strollers, scratching, and biting children in their quest for food. An adult squirrel needs to eat about a pound of food per week, and that must be quite a task for the little critter. Mountain View city officials will begin trapping and killing the squirrels over a three week period in hope of making the park a place fit for man, not beast. This morning I had to get down to the new Adidas by 6:30 am to help build a cage that Joe Montana & Gavin Newsom could throw footballs into on Market St. I woulda taken pictures of this photo op for ya’ll but I left my camera in the bar I had skiddaddled out of an hour before I had to be assembling their stage. There’s nothing like shaking off a buzz while watching Gavin Newsom and his very shiny waxy hair helmet wander around in his stocking feet admiring various sneakers. Gavin & Joe both had their feet “scanned” by some new fangled Adidas technology hooked up to plasma monitors, and apparently the red dot in Gavin’s sole imprint shows he puts a lot of pressure into his step . At some point an Adidas store rep got the mayor fitted into some custom kicks ( retail value approx $250). Meanwhile, while Joe & Gavin yukked it up for the media, I perused the scone selection at the Adidas hospitality table, and after an hour or so of painfully forced smiling & mingling Joe & Gavin split. As the former 49er QB passed through the crush of the velvet ropes, a middle aged woman in the horde got all pissy that Joe didn’t hang out & say Hi to her personally. The West Coast Green tradeshow and conference has been going on at the Bill Graham Civic Auditorium. Thursday and Friday were pre-registered tradeshow days primarily for people in the construction industry, but Saturday is geared towards homeowners. For a $20 entry fee (advanced registration, otherwise $30 at the door), you can check out the latest available products for ‘greening’ up your home or condo, and hear some inspiring panel discussions on the hows – and the whys – of going green. Take a look at the Saturday event schedule, which includes discussion on the best energy efficiency practices for homeowners, and homeowner case studies that will inspire you to finally install that solar collector, compost bin, or xeriscaping! Over a hundred b-boys and playas camped out in front of Niketown this afternoon, intent on being the first to see or purchase the new Air Jordans. I’ve camped out for tickets to games. Never for shoes. Amazing. A report released today by the federal Bureau of Labor Statistics says Bay Area workers are the highest paid in the country. Pay is 17 percent above the national average; workers in the construction and service industries earn 23 percent more than average. See above, dude. Looks to me like any barrista can buy a condo, right? Just learn to pull a latte and you’re going to be a Mission Bay resident with a bridge view in no time. Posted in News | Comments Off on We’re rich!